There is a striking contrast between the recent episcopal consecration by Bishop Williamson and those done by Archbishop Lefebvre in 1988. Archbishop Lefebvre had founded the Society of St. Pius X as a proper religious “society of common life without vows”, duly canonically approved by Bishop Charriere on November 1, 1970. There is no similar “society” with Bishop Williamson, the “sacerdotal union Marcel Lefebvre” has no real authority – Bishop Williamson himself said that such authority was now impossible – absolutely no canonical standing and no rules. Archbishop Lefebvre always strove to respect Canon Law, and obtained the approval of the proper authorities for his seminary of Econe and other priories until the illegal suppression of the SSPX in 1975 made it impossible; even then he filed two appeals at Rome, which Cardinal Villot buried. Since such appeals have “suspensive power”, the SSPX legally still exists in fact though often not recognized. It has been practically recognized since. This clearly shows that Archbishop Lefebvre never neglected Canon Law, never thought that “faith” would dispense him from the Canon Law! But where is such respect of Canon Law on Bishop Williamson’s part? It is nowhere to be seen. The Society of St. Pius X had lived and grown for more than 18 years, showing its vitality by its six seminaries, its solidly established chapels, schools, missions, organized in districts as is normal for a Catholic religious society. It had in 1988 more than 200 priests, plus more than 200 seminarians, brothers, sisters, oblates, etc. The “loose association” of priests with Bishop Williamson does not even have three years existence, with no regular order, practically no seminaries (the one in the Philippines in south of Manila was closed because their hostess was so disgusted by the disorder! ): they already have big divisions among themselves (to the point that some have already made civil lawsuits against others) and some are already openly sedevacantists, thus manifesting no unity among themselves: hence no solidity. It is claimed that Bishop Faure “intends” to open a seminary: how can he claim an “Operation Survival” for something that does not yet exist? What a contrast! Archbishop Lefebvre had already asked Cardinal Ratzinger in the early 80s for the consecration of a bishop, and for a whole year before the 1988 Consecrations, he made every effort possible to have it done with the proper papal mandate—to the point that the pope approved on May 5, 1988, the principle of a consecration by Archbishop Lefebvre. He then, on May 6th, asked for the practical realization of this approval, requesting a date for the ceremony: he had himself already postponed several times the date. Rome waited three weeks to give him a date, and the very letter offering a date asked for new candidates which made it impossible to be ready for that date. This dishonesty manifested that Rome did not intend to observe the approval given on May 5th, and by indefinite delays would make it void. This caused Archbishop Lefebvre not to delay any longer his “Operation Survival”. But where are the efforts of Bishop Williamson to obtain any approval by the pope? Absolutely none! What a contrast! The recognition of the authority of the pope was very clear and concretely manifested by the protocol; only the dishonesty of Rome made this protocol void. But the recognition of the authority of the pope by Bishop Williamson is only a theoretical recognition, denied in practice and by his many declarations rejecting ANY submission to the current pope. St. Augustine says that what makes a martyr is not the fact of suffering and death but the cause for which one dies (thus there are no Muslim martyrs!) Archbishop Lefebvre resisted real abuses AFTER they were done, not before! But Bishop Williamson and his followers resisted BEFORE any compromise by the SSPX was made, and even three years later such compromise is nowhere to be seen. Archbishop Lefebvre resisted BIG and evident scandals, such as the novelties of Vatican II (religious liberty, ecumenism, collegiality), the New Liturgy, with its communion in the hand, and many other “approved” practices and finally the huge scandal of Assisi in 1986. Bishop Williamson opposes some ambiguous words in a proposed April 2012 declaration, which was made void and completely discarded within months: the disproportion of the cause is again striking. 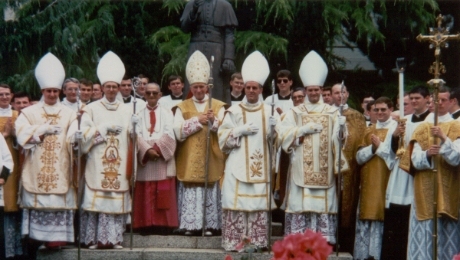 To assure the survival of the SSPX, Archbishop Lefebvre consecrated four bishops between 35 and 52 years younger than he was in 1988. Bishop Williamson pretends to assure a survival… by consecrating a bishop who is just one year younger than himself, very past secular retirement age and very close to bishops’ retirement age! Again, what a contrast!